Venezuela’s embattled President Nicolás Maduro has ordered the closure of the border with Brazil amid a row over foreign humanitarian aid. The leftist leader went on TV to say he was also considering shutting the key border with Colombia to stop the opposition bringing in relief. He denies any crisis and calls the aid delivery plans a US-orchestrated show. Opposition leader Juan Guaidó is leading a convoy from the capital, Caracas, to the Colombian border. Later on Friday, a concert will be held on the Colombian side of the border to raise money for Venezuela. At the same time, Mr Maduro’s government will hold its own event, reportedly just 300m (980ft) away. Mr Guaidó, head of the National Assembly, declared himself interim leader during anti-government protests last month and is recognised by dozens of countries, including the US and most Latin American nations. He and his allies hope to collect food and medicine being gathered in neighbouring Brazil and Colombia on Saturday, in defiance of President Maduro. 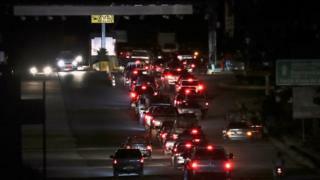 Flanked by Venezuela’s defence minister and other top military commanders, Mr Maduro announced that the border with Brazil would be closed “completely and absolutely” until further notice on Thursday night. The crossing usually closes at night and would normally open at 08:00 local time (12:00 GMT). After the announcement, many Venezuelans rushed to the Brazilian city of Pacaraima to stock up on supplies. The right-wing Brazilian government of President Jair Bolsonaro is among those that recognise Mr Guaidó as legitimate leader, pending elections. On Tuesday, Brazil announced that, in co-ordination with the US, food and medicine would be available in Pacaraima to be collected by “the government of acting President Juan Guaidó in Venezuelan trucks driven by Venezuelans”. British entrepreneur Sir Richard Branson has organised a concert near the Tienditas Bridge crossing, on the Colombian side of the border at Cúcuta, hoping to raise about $100m (£77m) to buy food and medicine for Venezuelans. Venezuela Aid Live, he said, has been organised at the request of Mr Guaidó and another opposition leader, Leopoldo López, who is under house arrest. About 250,000 people are expected to attend. Should Branson ‘back off’ from Venezuela? Not to be outdone, the Venezuelan government has erected a stage on its side of the crossing for its Hands Off Venezuela event. The Venezuelan military has so far managed to block shipments of US aid from coming from Colombia, and Mr Maduro said he had also been evaluating a “total closure” of this border. The government had already closed its sea and air border with Curaçao, a Dutch Caribbean island off Venezuela’s north coast where US aid is being stored. Despite denying there is any humanitarian crisis, Mr Maduro announced this week that 300 tonnes of aid would be shipped from its ally Russia. More than three million Venezuelans have fled in recent years as the country grapples with hyperinflation and shortages of essential goods, the UN says. Genuine help or Trojan horse? There is no doubt this has become a political issue. Juan Guaidó and his supporters want to spread the word about how important the foreign humanitarian aid is. President Maduro accuses it of being a Trojan horse. There is a feeling of optimism among many Venezuelans at the moment – an energy that has not existed in the country for a long time. And the hope that Saturday may be the start of a new path. But if the stand-off drags on, the fear is that this positive energy that has revived Mr Maduro’s critics will wane, as will the interest of the international community, and that’s what Mr Guaidó needs to achieve regime change. People want to know about a plan B – if indeed Mr Guaidó has thought of one. Otherwise, the hope here will soon turn to despair. Scuffles broke out and tear gas was fired when Mr Guaidó’s convoy of buses and cars was briefly stopped by security forces on a road near Mariara, west of Caracas, but it later moved on. It is expected to travel about 800-900km (500-560 miles) to Cúcuta in Colombia. “Confirmed – it’s rolling,” a spokesman for Mr Guaidó’s convoy told AFP news agency. Mr Guaidó has said 600,000 volunteers have already signed up to help carry aid into Venezuela on Saturday while the Venezuelan government said it would deliver 20,600 of its own food boxes to the Colombian border area. Mr Maduro, in power since 2013, has been criticised at home and abroad for his handling of the economy. But Venezuela’s military has so far resisted calls to abandon him. However, former military intelligence chief Hugo Carvajal called on the military to break with the president and to allow aid in. In a video address posted online, the congressman recognised Mr Guaidó as “president in charge” and issued a stinging rebuke to Mr Maduro. In another development, Mr Guaidó’s aides in Washington said 11 Venezuelan diplomats based in the US had defected and declared their support for him.